Human dendritic cells (DCs) are a distinct but heterogeneous lineage of APCs operating as the link between innate and adaptive immune responses, with the function to either maintain tolerance or trigger immunity. The DC lineage consists of several subpopulations with unique phenotypes; however, their functional characteristics and transcriptional similarities remain largely unknown. To further characterize the phenotypes and transcriptomes of the subsets, we purified myeloid CD16+, blood DC Ag 1+ (BDCA1+), and BDCA3+ DC populations, as well as plasmacytoid CD123+ DCs, from tonsillar tissue and peripheral blood. 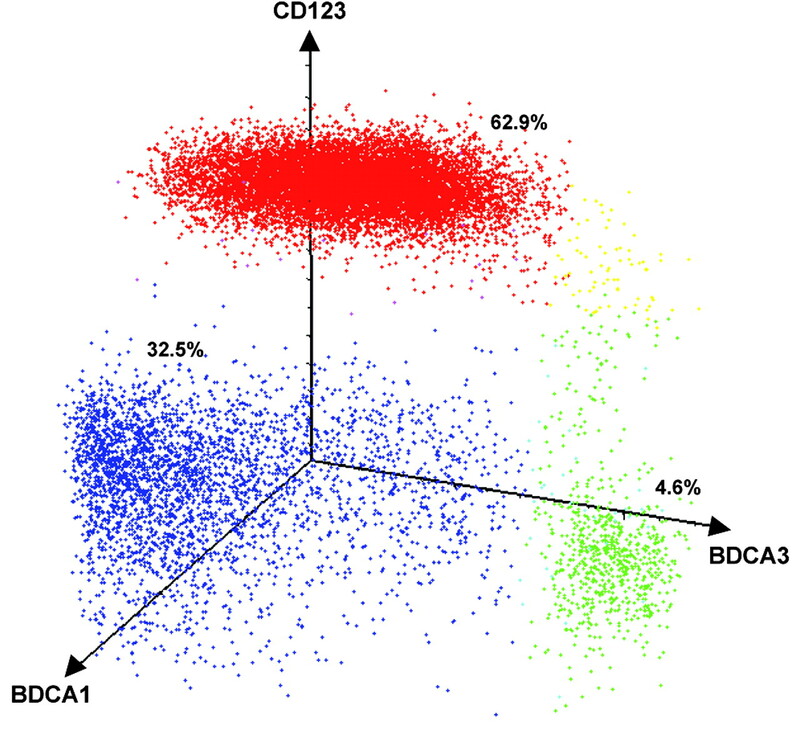 Transcriptional profiling and hierarchical clustering visualized that BDCA1+ DCs clustered with BDCA3+ DCs, whereas CD16+ DCs and CD123+ DCs clustered as distinct populations in blood. 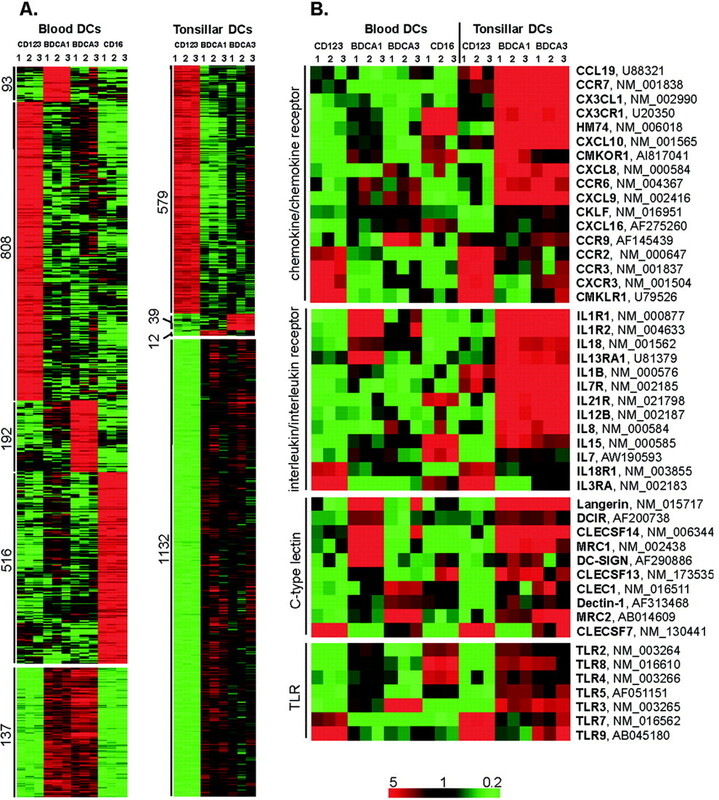 Differential expression levels of chemokines, ILs, and pattern recognition receptors were demonstrated, which emphasize innate DC subset specialization. Even though highly BDCA1+ and BDCA3+ DC-specific gene expression was identified in blood, the BDCA1+ DCs and BDCA3+ DCs from tonsils displayed similar transcriptional activity, most likely due to the pathogenic or inflammatory maturational signals present in tonsillar tissues. Of note, plasmacytoid DCs displayed less plasticity in their transcriptional activity compared with myeloid DCs. The data demonstrated a functionally distinct association of each of the seven subsets based on their signatures, involving regulatory genes in adaptive and innate immunity. Dendritic cells (DCs)4 constitute a distinct lineage of leukocytes with exclusive features, such as initiation of T cell responses (1). Serving as the gatekeeper between the innate and adaptive immune system, DCs are involved in the control of both tolerance and immunity. DCs have an outstanding capacity to present antigenic peptides in the context of MHC and selectively respond to environmental factors and pathogens through the repertoire of pattern recognition receptors (PPRs). Despite many common features within the lineage, DCs comprise a heterogeneous population of cells that originate from both lymphoid and myeloid progenitors (2). Recent evidence also shows that plasmacytoid DCs can originate from both lymphoid and myeloid pathways (3); however, the contribution of the respective precursors to the different DC subsets remains unclear. Multifaceted phenotypes and specialized functions of the different DC subpopulations, as well as their wide distribution, are factors that complicate the area of DC characterization. Their migratory behavior and membrane reorganization during maturation further adds to the complexity. In contrast to the numerous studies performed in mice, only limited data are presently available on human DCs. Limited knowledge of functionally associated DC subtypes, in combination with low frequencies of tissue DCs, have hampered their characterization. Nevertheless, plasmacytoid CD123+ DCs and myeloid CD11c+ DC populations have been defined in human thymus (4, 5), spleen (6), and tonsils (7). The majority of human ex vivo DC studies have been performed on DCs isolated from peripheral blood, which is a relatively consistent source of DCs. Based on lineage-specific marker negativity (Lin−) and HLA-DR+, these DC populations have been fractionated primarily by using Abs against CD11c and CD123. Abs to the DC-specific markers blood DC Ag 1–4 (BDCA1 to -4) have enabled further characterization of different DC subpopulations (8). Thus far, five DC subsets, expressing unique phenotypes, have recently been identified in human blood based on their expression of CD123, CD1c/b, BDCA3, CD34, and CD16 (9). Even though several different DC subsets have been identified in blood, more information about their relationship, functional properties, and tissue distribution is necessary. In this study, we further characterized the CD1c+ (BDCA1+) DCs, BDCA3+ DCs, CD16+ DCs, and CD123+ DCs isolated from peripheral blood, as well as identified and phenotypically characterized BDCA1+ DCs, BDCA3+ DCs, and CD123+ DCs in human tonsils. In addition, we performed a global transcriptional analysis of these discrete peripheral blood and tonsillar tissue DC subsets. We identified large clusters of DC subtype-specific gene expression and further analyzed their transcriptional relationship. Our data suggest that the defined subtypes are unique DC populations, exhibiting different repertoires of chemokine receptors, TLRs, and C-type lectins, indicating different functional roles. In addition to DC subtype-specific gene expression, we also identified transcription signatures common to BDCA1+ DCs and BDCA3+ DCs. These clusters of DC-specific markers offer new insights in the ontogeny and functional role of the different DCs subsets, and for identification of novel DC-specific markers. Human tonsils were obtained from children undergoing tonsillectomy at Lund University Hospital (Lund, Sweden). Tonsils were minced in RPMI 1640 medium (Sigma-Aldrich) supplemented with 0.2% gentamicin (Invitrogen Life Technologies), and the tissue was digested with 2 mg/ml collagenase IV and 100 U/ml DNase I for 15 min in room temperature. Released cells were filtered through 70-μm nylon cell strainers (Falcon; BD Biosciences) and washed once in gentamicin-supplemented RPMI 1640. PBMC were isolated from leukocyte-enriched buffy coats (Lund University Hospital) by Ficoll-Paque (Amersham Biosciences) density gradient centrifugation. T lymphocytes were depleted by rosetting with sheep erythrocytes treated with neuraminidase (Sigma-Aldrich). Further depletion of B cells, T cells, and monocytes was performed by magnetic separation, using anti-CD19-, anti-CD3-, and anti-CD14-coated beads (Dynal Biotech). Negatively selected cells enriched for DCs were incubated with FITC-conjugated mAbs against CD3 (BD Biosciences), CD14 and CD19 (DakoCytomation), allophycocyanin-conjugated anti-HLA-DR (BD Biosciences), and either PE-conjugated mAb against BDCA3 (Miltenyi Biotec) or CD123 (BD Pharmingen). The DC-enriched cells from peripheral blood were also labeled with PE-conjugated CD16 mAb (BD Biosciences). BDCA1+ DCs were incubated with a lineage-specific PE-labeled Ab mixture (DakoCytomation), HLA-DR-allophycocyanin (BD Biosciences), and BDCA1-FITC (Miltenyi Biotec). Lineage-negative and HLA-DRhigh DCs, positive for either BDCA1, BDCA3, CD123, or CD16, were then sorted on a FACSDiVa or a FACSAria (BD Biosciences) and collected in tubes containing 1 ml of 100% FBS. A total of 40,000–100,000 cells of each unique DC population was isolated. The purity of each blood or tonsil DC subpopulation was directly confirmed by reanalysis using a FACScan (BD Biosciences), and the cells were routinely >98% pure. DC samples were lysed in TRIzol reagent (Invitrogen Life Technologies) and stored at −20°C. Cell surface staining of blood and tonsillar DCs was performed on cells isolated either by magnetic cell sorting (MACS), with the BDCA1, BDCA3, or BDCA2 isolation kits (Miltenyi Biotec), or by FACSDiVa (BD Biosciences) sorting on lineage-negative cells. PBS, containing 1% BSA (w/v) and 2.5 mM EDTA, was used in all cell labeling and washing steps. Gates were set to exclude debris and nonviable cells on the basis of light scatter properties. To reduce unspecific binding, freshly sorted blood or tonsillar DCs were first blocked with ChromPure Mouse IgG (Jackson ImmunoResearch Laboratories) before incubation with the specific mouse mAbs for 30 min at 4°C. Analysis was performed on a FACScan or a FACSDiVa (BD Biosciences). The following mAbs were used for flow cytometry: FITC-conjugated CD11c, CD13, CD14, CD19, CD20, CD86 (DakoCytomation), HLA-DR, CD4, CD11b, CD44 (BD Biosciences), CD3, CD40, CD45RA (BD Pharmingen), CD80 (Immunotech), BDCA1 (Miltenyi Biotec), and CD44v7 (Chemicon International); PE-conjugated CD23 (BD Biosciences), CD123 (BD Pharmingen), BDCA3 (Miltenyi Biotec), and CD44v7 (Chemicon International); allophycocyanin-conjugated HLA-DR (BD Biosciences), BDCA3, and BDCA4 (Miltenyi Biotec); PE-Cy5-conjugated CD3, CD19 (DakoCytomation), biotin-conjugated HLA-DR, CXCR4 (BD Pharmingen), and unconjugated CD45RO (DakoCytomation). FITC- or PE-conjugated streptavidin (DakoCytomation), allophycocyanin-Cy7-conjugated streptavidin (BD Pharmingen), and PE- or PE-Cy5-conjugated rabbit anti-mouse Igs (DakoCytomation) were used as secondary reagents. For graphic three-dimensional visualization and color coding, the analyzed fcs-file, generated by the FACSDiVa, was imported into GeneSpring 7.1 software (Silicon Genetics). BDCA1+ DCs, BDCA3+ DCs, and CD123+ DCs from tonsils, and BDCA1+ DCs, BDCA3+ DCs, CD16+ DCs, and CD123+ DCs from peripheral blood were sorted from three different donors, giving a total of 21 samples, each containing 40,000–100,000 cells. Fragmentation, hybridization, and scanning of the Human Genome U133 Plus 2.0 Arrays were performed according to the manufacturer’s protocol (Affymetrix). The preparation of labeled cRNA was performed according to the Two-cycle Eukaryotic Target Labeling assay protocol, using the GeneChip Expression 3′ amplification two-cycle labeling and control reagents kit (Affymetrix). Briefly, cDNA was generated from total RNA (20–150 ng), using SuperScript II (Invitrogen Life Technologies) and a T7-oligo(dT) promoter primer (Affymetrix). After a second-strand cDNA synthesis, cDNA was converted to cRNA by an in vitro transcription reaction (Ambion MEGAscript T7 kit). Thereafter, the cRNA was purified using RNeasy Mini kit (Qiagen), and the yield was controlled with a spectrophotometer. A second cycle of cDNA synthesis was performed, followed by the same cleanup as above and a second in vitro transcription reaction cycle with biotin-labeled ribonucleotides and T7 RNA polymerase. Labeled cRNA was purified, using RNeasy Mini kit (Qiagen), quality controlled with Agilent 2100 Bioanalyzer (Agilent Technologies), and denatured at 94°C before hybridization. The samples were hybridized to the Human Genome U133 Plus 2.0 Array at 45°C for 16 h by rotation (60 rpm) in an oven. The arrays were then washed, stained with streptavidin-PE (Molecular Probes), washed again, and scanned with a GeneArray Scanner (Affymetrix). The fluorescence intensity was analyzed, using the GeneChip Operating Software (GCOS) 1.1 (Affymetrix), and scaled to a target value of 100. Further data analysis was performed with GeneSpring 7.1 software. For clustering, the samples were normalized both per chip, to the 50th percentile, and per gene, which makes the median value for each gene across the samples equal to 1. A tree clustering was performed on the individual samples to distinguish sample relationship and replicate similarities. The tree clustering algorithm, based on Spearman correlation, was used on genes denoted P (present) in at least one DC population (three replicates) and displaying a fold change in mean expression level of ±2 between two populations, giving a total of 13,931 genes. Thus, the degree of similarity between the samples was based on differentially expressed transcripts, thus excluding genes not changing in expression level between the DC populations, such as housekeeping genes, or absent genes. K-means clustering was performed to identify expression patterns in both blood and tonsillar DCs, and the identified clusters were further evaluated with filtering procedures. To identify DC subset-specific gene transcription, we performed a stringent analysis with criss-cross comparisons between the triplicates of all DC subtypes, in both blood and tonsils. For instance, for transcripts to be identified as CD16+ DC-selective, each replicate had to display differential expression compared with all other DC replicates in blood, based on >2-fold expression change, present call (P) and raw signal intensity >20 to eliminate borderline expression consisting of random noise. This strategy of pairwise comparisons was used to extract the subset-specific transcriptomes for each DC population in blood and tonsils. All data are MIAME compliant and have been submitted to ArrayExpress database (〈www.ebi.ac.uk/miamexpress〉; accession no. E-TABM-34). The composition of DC populations in tonsils was initially studied by phenotypic analysis of the lineage-negative mononuclear cells. 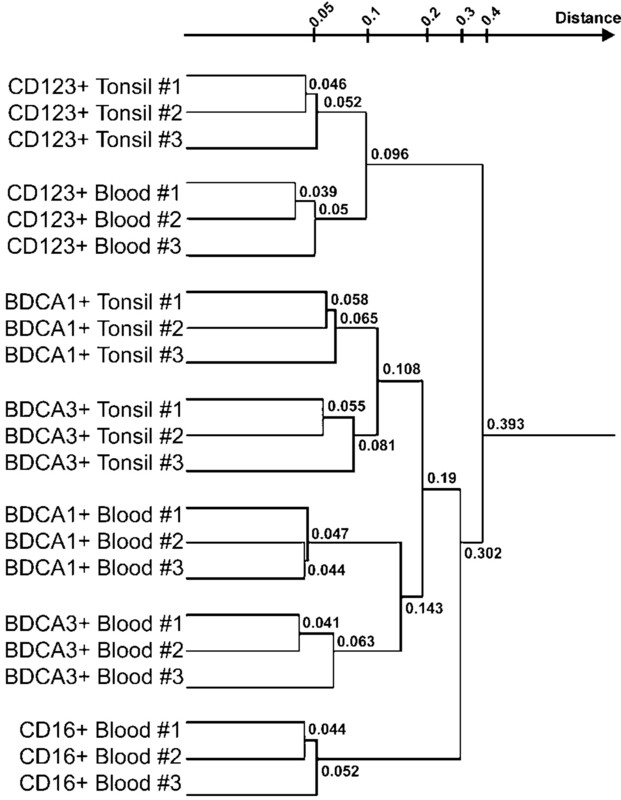 We could identify the myeloid BDCA1+ DCs, BDCA3+ DCs, and plasmacytoid CD123+ DCs in both blood and tonsillar tissue, although the BDCA3+ DC subset was less distinctive in tonsils compared with blood, whereas the CD16+ DC subset was present only in blood. Furthermore, similar to blood DCs, the tonsillar BDCA1+ DCs, BDCA3+ DCs, and CD123+ DCs could be identified as unique DC subsets (Fig. 1⇓), even though a minor fraction of CD123+BDCA3+ DCs was recognized. The phenotypes of these seven DC populations were analyzed by flow cytometry (Table I⇓). A total of 40,000–100,000 cells from three independent donors were sorted to a purity exceeding 98% (data not shown) from both tonsils and blood and immediately frozen for RNA extraction. It was evident that the populations consisting of BDCA1+ DCs and BDCA3+ DCs exhibited a fairly similar phenotype both in blood and tonsils. Also, the phenotype of tonsillar CD123+ DCs was similar to that of blood CD123+ DCs. Among the cell surface markers that actually did vary between the blood DC subsets were CD11b, CD11c, CD13, CD40, CD45RA, and CD45RO. In tonsils, BDCA1+ DCs and BDCA3+ DCs displayed up-regulation of CD40, CD44v7, and CXCR4, compared with their blood counterparts. The DC populations in blood and tonsils were FACS sorted from mononuclear cells depleted of monocytes, B cells, and T cells (Fig. 2⇓). Flow-cytometric analysis of lineage-negative mononuclear cells, isolated from human tonsillar tissue, identifies three unique DC subsets. Gates were set to include only viable cells, as determined by forward- and side-scatter characteristics. Furthermore, cells were gated to be both lineage negative and either BDCA1 (blue), BDCA3 (green), or CD123 (red) positive. The percentages represent relative levels of the different DC populations from one representative experiment. Scheme for sorting DC subpopulations from peripheral blood and tonsillar tissue. Mononuclear cells, enriched for DCs by depletion of CD3-, CD14-, and CD19-positive cells, were stained with Lineage, HLA-DR, and one of the CD123, CD16, BDCA1 or BDCA3 mAbs. Gates were set to include viable cells, as determined by forward- and side-scatter characteristics. Thereafter, gates were set to exclude Lin+ cells (A). Finally, Lin− cells were positively sorted based on the phenotype of HLA-DR+DC-marker+ (B). A total of 40,000–100,000 cells of the CD16+, CD123+, BDCA1+, and BDCA3+ DC populations were sorted, from three donors, from blood and tonsils, to a purity of >98%. RNA from each DC population was hybridized to Affymetrix Human Genome U133 Plus 2.0 arrays containing >54,000 probe sets, which cover 38,500 human genes. Arrays were run in triplicate, with RNA from three different donors, for each DC population. For each subset, the intensity signals for selected marker genes were assessed that were expected to be either expressed and thus denoted present, or absent (Fig. 3⇓). CD1c (BDCA1), CD16, the myeloid cell marker CD11c, as well as the plasmacytoid DC markers CD123 and BDCA2 were selected as positive controls (Fig. 3⇓A). A probe set representing the BDCA3 gene was not present on the array and could thus not be included. CD11c was, as expected, expressed by the CD16+, BDCA1+, and BDCA3+ subsets, but not by CD123+ DCs. CD123, CD16, and BDCA1 were expressed primarily by the appropriate populations, even though low expression of these markers could be detected in the BDCA3+ DC subset. To exclude the possibility of contaminating cell types in the DC populations, a selection of B cell, T cell, monocyte, and NK cell marker genes were analyzed (Fig. 3⇓B). These negative controls, consisting of CD3, CD19, CD14, CD56, CD8, and TCR genes, were either denoted absent by the detection call or, in a few cases, expressed at low levels. Overall, the concordance between the high expression levels of the indicator genes and the low or absent expression of lineage-marker genes, clearly show that the DC isolations have been performed without contamination. Gene expression level of selected control genes. A, Mean values from DC subset triplicates are represented for positive control transcripts; CD123 (NM_002183), CD1c/BDCA1 (NM_001765), CD16 (NM_000570), BDCA2/CLECSF7 (NM_130441), and CD11c (M81695). If two or more copies of a specific gene, with different GenBank numbers, were present on the array, the mRNA reference sequence was chosen. The y-axis displays raw signal intensity and the x-axis numbers represent the following DC subsets: tonsil BDCA1+ DCs (1), blood BDCA1+ DCs (2), tonsil BDCA3+ DCs (3), blood BDCA3+ DCs (4), blood CD16+ DCs (5), tonsil CD123+ DCs (6), and blood CD123+ DCs (7). B, Expression levels of selected NK cell-, B cell-, T cell-, and monocyte-specific genes as negative controls. Mean value of replicate samples are represented. The minus sign (−) denotes samples with an absent (A) detection call in one to three of the replicate samples. To determine the relationship between DC subsets and correlation between triplicate samples, hierarchical clustering was performed on differentially expressed genes in the entire data set (Fig. 4⇓). The plasmacytoid CD123+ DCs from blood and tonsils clustered together and were separated from the myeloid CD16+, BDCA1+, and BDCA3+ DC subsets. The gene expression of BDCA1+ DCs in blood was more similar to the BDCA3+ DC population in blood than the BDCA1+ DC population in tonsils (and vice versa for BDCA3+ DCs). However, the CD16+ DCs were separated from both the BDCA1+ DCs and the BDCA3+ DCs isolated from blood and tonsillar tissue. Reproducibility of transcriptional data and subset relationship determined by hierarchical clustering of replicate DC samples. Clustering, using Spearman correlation, was performed on genes changing in expression level with at least a 2-fold change between two DC populations (as described in Materials and Methods). The node number (the distance, displayed in log scale) represents the degree of similarity between the samples. Thus, if two samples are grouped under one branch with a distance 0.05, the correlation is 0.95. Patterns of transcription in blood and tonsillar DCs were identified by K-means clustering analysis on the differentially expressed genes selected above. In addition to the subtype-specific gene expression, a set of genes expressed by both BDCA1+ DCs and BDCA3+ DCs was recognized (Fig. 5⇓A). A significant number of genes were found to be differentially transcribed between the various subsets, in that 808 and 579 genes were preferentially expressed by plasmacytoid DCs in blood and tonsils, respectively, whereas 516 transcripts were identified as CD16+ DC-selective. Furthermore, BDCA1+ DCs and BDCA3+ DCs in blood also exhibited selective transcription with 93 and 192 genes, respectively, in addition to a common set of 137 expressed genes. A similar pattern of expression was detected in tonsillar DCs, with an even greater overlap in expression (1132 genes) in BDCA1+ DCs and BDCA3+ DCs. Hierachical clustering of differentially expressed genes in tonsillar and peripheral blood DC subsets. A, Subset-specific transcriptional patterns, identified by K-means analysis and filtering (described in Materials and Methods) are illustrated by gene clustering. Color changes, within a row, indicate expression levels relative to the median of the sample population. Because the samples are normalized to a median value of 1, the color bar range of 5 (red) to 0.2 (green) represents high and low expression levels, respectively. B, Subset-specific gene expression shown according to their distribution in functional gene clusters. We next turned to the identification of gene families, indicating different roles of the isolated DC subsets. Within the data set of 3508 differentially regulated genes (Fig. 5⇑A), we identified a vast number of functionally associated genes, involved in, e.g., Ag uptake, signaling, migration, etc., suggesting that the distinct DC subsets are specialized for different tasks. The distribution of chemokines and ILs, their receptors, as well as C-type lectins and TLRs, are presented in Fig. 5⇑B. It was evident that the BDCA1+ DCs and BDCA3+ DCs isolated from tonsils displayed the most similar expression profiles of these functionally clustered genes, although a few subtype-specific transcripts could be identified as well. Furthermore, in the blood DC populations, BDCA3+ DCs primarily expressed TLR3, CD16+ DCs expressed TLR8, whereas plasmacytoid DCs expressed TLR7 and TLR9. Among the C-type lectins, BDCA3+ DCs in blood demonstrated the highest levels of MRC2, and this subset selectivity was also found in tonsils. Blood BDCA1+ DCs, in contrast, expressed DCIR, C-type lectin superfamily member (CLECSF)14, MRC1, and DC-SIGN, whereas plasmacytoid cells expressed CLECSF7 (BDCA2). The majority of differentially expressed ILs, chemokines, and their receptors were found in the tonsillar BDCA1+ DCs and BDCA3+ DCs. In blood, CX3CR1 was CD16+ DC-selective, whereas CCR9 was expressed primarily by BDCA3+ DCs. We also identified expression of chemokine-like factor (CKLF) and chemokine orphan receptor (CMKOR1) in the myeloid DC populations, which previously has not been reported to be expressed by DCs. CMKOR1 was primarily expressed by the CD16+ DCs and BDCA1+ DC subsets in blood and by the myeloid DC populations in tonsils, whereas CKLF was expressed by BDCA1+ DCs and BDCA3+ DCs, irrespectively of tissue source. Furthermore, in blood, IL1R1, IL1R2, and IL13RA1 were primarily expressed by BDCA1+ DCs, whereas IL21R was expressed by CD16+ DCs and IL18R1 by plasmacytoid DCs. Overall, the transcriptional signatures of CD123+ DCs in blood and tonsils were quite similar, and the CD123+ DCs expressed a common set of TLRs, chemokine receptors, IL receptors, and C-type lectins. In contrast, DC subtype-specific gene expression was evident among the myeloid cells in blood, whereas the tonsillar BDCA1+ DCs and BDCA3+ DCs expressed a majority of the functionally associated markers (summarized in Table II⇓). Identification and characterization of distinct subgroups of DCs are important to advance our understanding of their role in regulating the immune response in health and disease. In this study, we attempt to phenotypically describe the myeloid and plasmacytoid DCs found in circulation and in secondary lymphoid tissue and to illustrate their relationship and subset-specific transcriptionally clusters, with emphasis on immune response-associated gene families. Characterization of the complete human transcriptome with gene expression profiling is well suited for addressing any global disparity between DC subsets, identifying novel DC markers and describing the complexity of biological processes. Thus, the expression profiling not only describes the specialization of the respective subtype, but also portrays the transcriptional changes involved in the process of migration and functional reprogramming during relocation of DCs from peripheral blood to secondary lymphoid organs. Consequently, we isolated DC subsets found in peripheral blood (9) and compared them with the tonsillar DC counterparts. 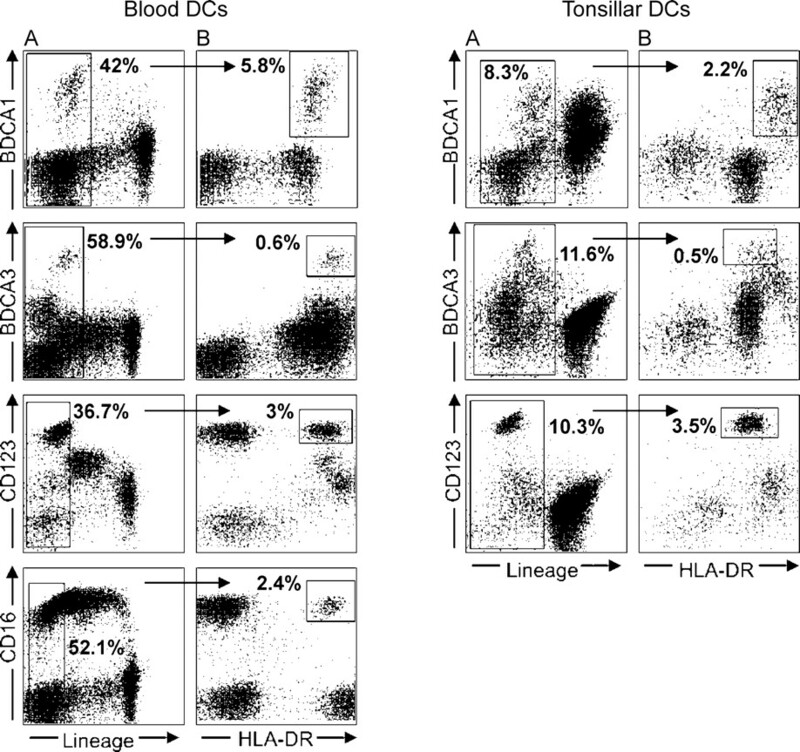 The phenotype of tonsillar DC populations has previously been described based on their relative expression of HLA-DR, CD11c, CD123, and CD13 (7). The DC subsets were, for instance, described as HLA-DRhighCD11c+ DCs, HLA-DRmodCD11c+CD13+ DCs, and HLA-DRmodCD11c−CD123+ DCs. Identification of the subset-specific DC markers enabled us to use positive selection of these subsets. In a phenotypical comparison between our data and the study by Summers et al. (7), it appears that the isolated BDCA1+ DCs and BDCA3+ DCs in our system resembles the HLA-DRhighCD11c+ DCs and HLA-DRmodCD11c+CD13+ DCs, respectively, based on their expression of, e.g., CD45RO and CD45RA. Hierarchical clustering emphasizes the similarities between triplicate samples and visualizes the transcriptional relationship between the DC subtypes. As expected, the plasmacytoid DCs are separated from the other subtypes classically referred to as the myeloid DCs. Even though CD16+ DCs are distinct from the BDCA1+ DCs and BDCA3+ DCs, they still cluster with the myeloid cells. 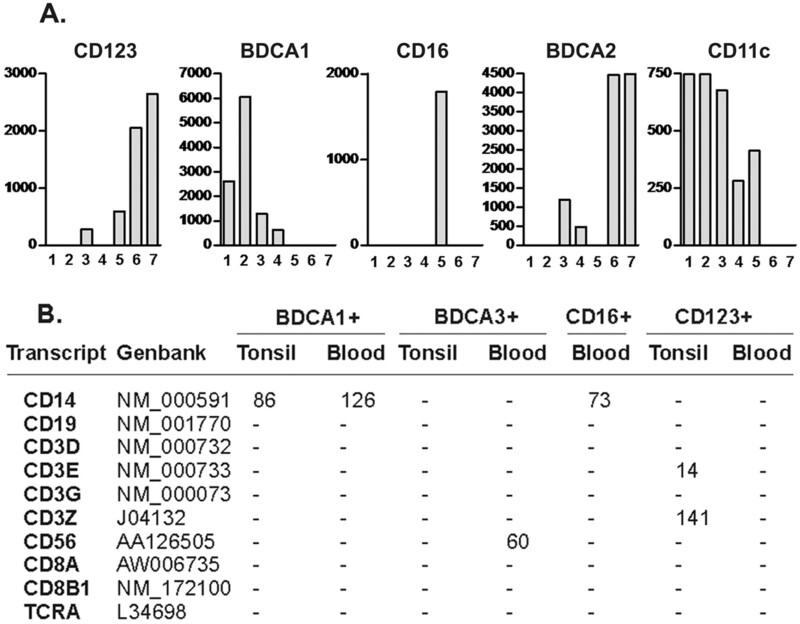 The relationship between BDCA1+ DCs and BDCA3+ DCs in blood and tonsils, demonstrates a subset similarity and that their transcription is determined by tissue distribution. Our results suggest that CD123+ DCs and CD16+ DCs arise from separate precursor cells, whereas BDCA1+ DCs and BDCA3+ DCs may have a common origin and rather represent two different stages of a similar subset. Even though the identified subset-selective genes do not necessarily represent unique markers for a given population, the pronounced difference in expression levels and the vast number of genes differentially expressed between DC populations indicate that these cell types indeed have specialized functions that are related to their distinct lineage. In addition, among the numerous genes differentially expressed between the DC subtypes, some transcripts might not result in protein product. However, the availability of the raw data in ArrayExpress will allow investigators to perform further analysis. To pinpoint the innate diversity between DC subsets, we focused on expression of PPRs, cytokines, and chemokines. Both myeloid and plasmacytoid DCs use a sophisticated repertoire of PPRs, such as the TLRs (10) and C-type lectins (11), to recognize pathogen-associated molecular patterns. A specialization of microbial molecule recognition by the peripheral blood CD1c+ (BDCA1+) DC and plasmacytoid DC subsets has been demonstrated on the mRNA level by PCR (12). Whereas CD1c+ DCs expressed TLR2, -4, -5, -6, and -8, plasmacytoid DCs expressed only TLR7 and -9. In this report, we confirm these data and further show that the BDCA3+ and CD16+ DC subsets also display specialized TLR repertoires. Blood-derived BDCA3+ DCs selectively expressed mRNA for TLR3, whereas the tonsillar BDCA1+ DCs and BDCA3+ DCs both expressed TLR3. ssRNA were recently identified as natural ligands for the structurally related TLR7 and TLR8 (13, 14). However, agonists to TLR7 and -8 have shown that they are functionally distinct in innate immunity, because TLR7 ligation induces IFN-α production by plasmacytoid DCs, whereas TLR8 ligation stimulates IL-12 production by monocyte-derived DCs and CD11c+ blood DCs (15). Based on our microarray data, the CD16+ DC population may exert such a specialization toward ssRNA, because the subset preferentially expresses TLR8 in blood. In addition to differential TLR expression patterns among the DC subsets, we also identified selective expression of C-type lectins in blood-derived BDCA1+ DCs (DCIR, CLECSF14, MRC-1, DC-SIGN) and BDCA3+ DCs (CLEC1, MRC-2), with particularly pronounced common expression by BDCA1+ DCs and BDCA3+ DCs in tonsils (Langerin, Dectin-1, CLECSF13, CLECSF14, MRC-1). DC-SIGN, mannose receptor (MRC-1), and dectin-1 (CLECSF12) are receptors for fungal-derived carbohydrates, such as mannose, fucose, or β-glucans (16). The expression of these lectins by BDCA1+ DCs may enable them to selectively respond to a variety of exogenous ligands, such as bacteria (e.g., Mycobacterium tuberculosis), viruses (e.g., HIV), and fungi (e.g., Candida albicans), as reviewed in Refs.11 and 17 . Even though MRC-2 (Endo180) is a member of the mannose receptor family, it seems that MRC-1 and MRC-2 have a distinct set of glycoprotein ligands (18). Expression of MRC-2 by DCs has, to our knowledge, not been reported previously. The fact that we identified MRC-2 as preferentially expressed by BDCA3+ DCs in blood and tonsils, suggests that this subset is specialized to recognize different glycoproteins compared with the MRC-1-expressing BDCA1+ DCs. DCIR and BDCA2 (CLECSF7), selectively expressed by BDCA1+ DCs and CD123+ DCs, respectively, belongs to the DCIR family of C-type lectins, whose biological ligands and function are largely unknown (19). Furthermore, we identified expression of CLEC1, CLECSF13, and CLECSF14, not previously described in primary DCs. The function and ligands of these lectins remains to be determined. Plasmacytoid DCs expressed a similar profile of chemokine receptor expression (CCR2, CCR3, CXCR3, and CMKLR1) in both tonsils and blood. CXCR3 is expressed by blood plasmacytoid DCs (20) and is required for migration of these cells into inflamed lymph nodes (21). Unexpectedly, we detected the CXCR3 ligands CXCL9 and CXCL10 in BDCA1+ DCs and BDCA3+ DCs in tonsils. Recently, blood plasmacytoid DCs, but not myeloid DCs, were shown to express CMKLR1 and migrate in response to the CMKLR1-ligand chemerin, which is activated during blood coagulation (22). This may enable plasmacytoid DCs to migrate to sites of bleeding, tissue damage, and inflammation. Interestingly, we detected CMKLR1 mRNA in tonsillar plasmacytoid DCs in addition to blood plasmacytoid DCs, which suggests that the receptor may be involved in migration to lymphoid tissues with high infectional load. Furthermore, subset-specific transcription of chemokine receptors was detected in blood DCs, because CD16+ DCs expressed CX3CR1 and HM74, whereas BDCA3+ DCs expressed CCR9. Interestingly, the majority of differentially expressed chemokines/chemokine receptors were induced in the myeloid DCs in tonsils. Myeloid DCs are known to up-regulate CCR7 during maturation and acquire responsiveness to the CCR7 ligand CCL19 (ELC) (23). Of note, both CCR7 and CCL19 were up-regulated in the myeloid DCs in tonsils and, to a lesser extent, in tonsillar plasmacytoid DCs, suggesting that CCL19 can act in an autocrine and paracrine fashion to keep the CCR7+ cells in the vicinity. Furthermore, the wide range of chemokines/chemokine receptors expressed by tonsillar myeloid DCs may also be important for selective attraction of specific cell types within the tissue, e.g., CXCL16 (24), in combination with responses to exogenous mediators produced as a result of inflammatory stimulation, e.g., CMKLR1 (22) and CXCL8 (IL-8) (25). The differential expression of cytokines/cytokine receptors by blood and tonsillar DCs may also provide information about their innate functions and ability to polarize the immune response. Similar to the chemokines, a majority of the differentially expressed ILs/IL receptors was found in the myeloid DCs isolated from tonsils. IL-18 was recently shown to attract plasmacytoid DCs through IL-18R and promote Th1 induction (26), suggesting a role for IL-18 in the recruitment of plasmacytoid DCs to sites of inflammation. IL-18R is also expressed selectively by Th1, and not by Th2 cells, and IL-12 and IL-18 synergize in the induction of IFN-γ production by Th1 cells (27). Interestingly, IL18 and IL12B were both expressed mainly by the myeloid tonsillar DC subsets, which suggests ongoing Th1 priming in the lymphoid compartment. IL-18 is related to the IL-1 family and shares many functions with IL-1β, such as induction of proinflammatory cytokines and protection against infections (28). Interestingly, transcription of IL1R1, IL1R2, and IL1B was also detected in tonsillar myeloid DCs. In conclusion, we have identified large clusters of DC subset-specific gene expression, which suggests that the isolated DC subsets are highly specialized and respond to different spectra of pathogens. Furthermore, the transcriptional activity in the tonsillar BDCA1+ DCs and BDCA3+ DCs populations was more pronounced and these DC subsets displayed a switch in expression of chemokine/chemokine receptors and IL/IL receptors in tonsils, compared with blood. Because no exogenous trigger was included in this study, we depended solely on the tonsil environment to affect the isolated DC populations. In contrast, plasmacytoid DCs in blood and tonsils expressed a similar set of chemokine receptors, IL receptors, and PPRs, which suggests that plasmacytoid DCs are less prone to switch their functional repertoire in the secondary lymphoid organs and may not be as sensitive to the environment in tonsils as the myeloid DCs. We thank Ann-Charlotte Olsson for expert laboratory assistance and Carl-Magnus Högerkorp for advice regarding cell sorting. ↵1 This work was supported by a grant from Vetenskapsrådet. ↵2 M.L. and K.L. contributed equally to this article. ↵4 Abbreviations used in this paper: DC, dendritic cell; BDCA, blood DC Ag; PPR, pattern recognition receptor; CLECSF, C-type lectin superfamily member. Steinman, R. M.. 2003. Some interfaces of dendritic cell biology. APMIS 111:675.-697. Liu, Y. J.. 2001. Dendritic cell subsets and lineages, and their functions in innate and adaptive immunity. Cell 106:259.-262. Shigematsu, H., B. Reizis, H. Iwasaki, S. Mizuno, D. Hu, D. Traver, P. Leder, N. Sakaguchi, K. Akashi. 2004. Plasmacytoid dendritic cells activate lymphoid-specific genetic programs irrespective of their cellular origin. Immunity 21:43.-53. Bendriss-Vermare, N., C. Barthelemy, I. Durand, C. Bruand, C. Dezutter-Dambuyant, N. Moulian, S. Berrih-Aknin, C. Caux, G. Trinchieri, F. Briere. 2001. Human thymus contains IFN-α-producing CD11c−, myeloid CD11c+, and mature interdigitating dendritic cells. J. Clin. Invest. 107:835.-844. Vandenabeele, S., H. Hochrein, N. Mavaddat, K. Winkel, K. Shortman. 2001. Human thymus contains 2 distinct dendritic cell populations. Blood 97:1733.-1741. McIlroy, D., C. Troadec, F. Grassi, A. Samri, B. Barrou, B. Autran, P. Debre, J. Feuillard, A. Hosmalin. 2001. Investigation of human spleen dendritic cell phenotype and distribution reveals evidence of in vivo activation in a subset of organ donors. Blood 97:3470.-3477. Summers, K. L., B. D. Hock, J. L. McKenzie, D. N. Hart. 2001. Phenotypic characterization of five dendritic cell subsets in human tonsils. Am. J. Pathol. 159:285.-295. Dzionek, A., A. Fuchs, P. Schmidt, S. Cremer, M. Zysk, S. Miltenyi, D. W. Buck, J. Schmitz. 2000. BDCA-2, BDCA-3, and BDCA-4: three markers for distinct subsets of dendritic cells in human peripheral blood. J. Immunol. 165:6037.-6046. MacDonald, K. P., D. J. Munster, G. J. Clark, A. Dzionek, J. Schmitz, D. N. Hart. 2002. Characterization of human blood dendritic cell subsets. Blood 100:4512.-4520. Reis e Sousa, C.. 2004. Toll-like receptors and dendritic cells: for whom the bug tolls. Semin. Immunol. 16:27.-34. McGreal, E. P., J. L. Miller, S. Gordon. 2005. Ligand recognition by antigen-presenting cell C-type lectin receptors. Curr. Opin. Immunol. 17:18.-24. Jarrossay, D., G. Napolitani, M. Colonna, F. Sallusto, A. Lanzavecchia. 2001. Specialization and complementarity in microbial molecule recognition by human myeloid and plasmacytoid dendritic cells. Eur. J. Immunol. 31:3388.-3393. Heil, F., H. Hemmi, H. Hochrein, F. Ampenberger, C. Kirschning, S. Akira, G. Lipford, H. Wagner, S. Bauer. 2004. Species-specific recognition of single-stranded RNA via Toll-like receptor 7 and 8. Science 303:1526.-1529. Diebold, S. S., T. Kaisho, H. Hemmi, S. Akira, C. Reis e Sousa. 2004. Innate antiviral responses by means of TLR7-mediated recognition of single-stranded RNA. Science 303:1529.-1531. Gorden, K. B., K. S. Gorski, S. J. Gibson, R. M. Kedl, W. C. Kieper, X. Qiu, M. A. Tomai, S. S. Alkan, J. P. Vasilakos. 2005. Synthetic TLR Agonists Reveal Functional Differences between Human TLR7 and TLR8. J. Immunol. 174:1259.-1268. Herre, J., S. Gordon, G. D. Brown. 2004. Dectin-1 and its role in the recognition of β-glucans by macrophages. Mol. Immunol. 40:869.-876. Taylor, P. R., S. Gordon, L. Martinez-Pomares. 2005. The mannose receptor: linking homeostasis and immunity through sugar recognition. Trends Immunol. 26:104.-110. East, L., S. Rushton, M. E. Taylor, C. M. Isacke. 2002. Characterization of sugar binding by the mannose receptor family member, Endo180. J. Biol. Chem. 277:50469.-50475. Kanazawa, N., K. Tashiro, Y. Miyachi. 2004. Signaling and immune regulatory role of the dendritic cell immunoreceptor (DCIR) family lectins: DCIR, DCAR, dectin-2 and BDCA-2. Immunobiology 209:179.-190. Penna, G., S. Sozzani, L. Adorini. 2001. Cutting edge: selective usage of chemokine receptors by plasmacytoid dendritic cells. J. Immunol. 167:1862.-1866. Yoneyama, H., K. Matsuno, Y. Zhang, T. Nishiwaki, M. Kitabatake, S. Ueha, S. Narumi, S. Morikawa, T. Ezaki, B. Lu, et al 2004. Evidence for recruitment of plasmacytoid dendritic cell precursors to inflamed lymph nodes through high endothelial venules. Int. Immunol. 16:915.-928. Zabel, B. A., A. M. Silverio, E. C. Butcher. 2005. Chemokine-like receptor 1 expression and chemerin-directed chemotaxis distinguish plasmacytoid from myeloid dendritic cells in human blood. J. Immunol. 174:244.-251. Sallusto, F., P. Schaerli, P. Loetscher, C. Schaniel, D. Lenig, C. R. Mackay, S. Qin, A. Lanzavecchia. 1998. Rapid and coordinated switch in chemokine receptor expression during dendritic cell maturation. Eur. J. Immunol. 28:2760.-2769. Shimaoka, T., T. Nakayama, N. Fukumoto, N. Kume, S. Takahashi, J. Yamaguchi, M. Minami, K. Hayashida, T. Kita, J. Ohsumi, et al 2004. Cell surface-anchored SR-PSOX/CXC chemokine ligand 16 mediates firm adhesion of CXC chemokine receptor 6-expressing cells. J. Leukocyte Biol. 75:267.-274. Lindstedt, M., B. Johansson-Lindbom, C. A. Borrebaeck. 2002. Global reprogramming of dendritic cells in response to a concerted action of inflammatory mediators. Int. Immunol. 14:1203.-1213. Kaser, A., S. Kaser, N. C. Kaneider, B. Enrich, C. J. Wiedermann, H. Tilg. 2004. Interleukin-18 attracts plasmacytoid dendritic cells (DC2s) and promotes Th1 induction by DC2s through IL-18 receptor expression. Blood 103:648.-655. Xu, D., W. L. Chan, B. P. Leung, D. Hunter, K. Schulz, R. W. Carter, I. B. McInnes, J. H. Robinson, F. Y. Liew. 1998. Selective expression and functions of interleukin 18 receptor on T helper (Th) type 1 but not Th2 cells. J. Exp. Med. 188:1485.-1492. Biet, F., C. Locht, L. Kremer. 2002. Immunoregulatory functions of interleukin 18 and its role in defense against bacterial pathogens. J. Mol. Med. 80:147.-162.